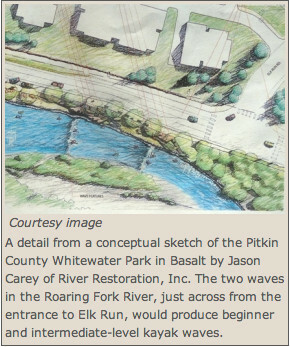 From the get-go, the Basalt Whitewater Park was a balancing act designed to simultaneously enhance the riparian habitat of the Roaring Fork River, slow the flow of runoff, give anglers the opportunity to match wits with fish and provide kayakers and rafters with a means by which they could get their adrenal glands pumping. While people seem to appreciate the effort, opinions expressed at a forum organized Tuesday evening by Pitkin County’s Healthy Rivers program indicated there is work yet to be done. The forum, which took place at the Basalt Library, brought together about 30 river enthusiasts covering the recreational gamut from fisherpeople to hard-core kayakers to boaters with a more recreational bent. The consensus seemed to be that the engineers who did the work throughout last winter need to fine tune their efforts. “It is more rowdy that we had hoped,” said Quinn Donnelly, a river engineer with Carbondale-based River Restoration, the company that designed and constructed the $800,000 whitewater park. According to Donnelly, the park functioned at its best when the water levels went down from their peak of about 3,500 cubic feet per second (cfs) on June 19. “At about 700 cfs, the flows worked really well for a wide range of skills,” Donnelly said. But, when those water levels were higher, spam was definitely hitting the fan. While Donnelly said the upper feature was classified at about Class-3 during the height of runoff, people in the audience begged to differ. One person speculated that the upper feature was closer to class-4, while another said it nudged up to class-5. Several members of the audience related takes about spending significant time upside-down and bouncing off boulders while attempting to navigate the man-made rapids.